Those awaiting results of November 2015 Chemical Engineer board exam can find here the complete list of passers, top 10 (topnotchers), top performing schools and performance of schools as the Professional Regulation Commission (PRC) and the Board of Chemical Engineering (ChemEng) released results in 2 working days after the last day of exams. PRC on Monday, November 23 said that 466 out of 874 passed the Chemical Engineer Licensure Examination. 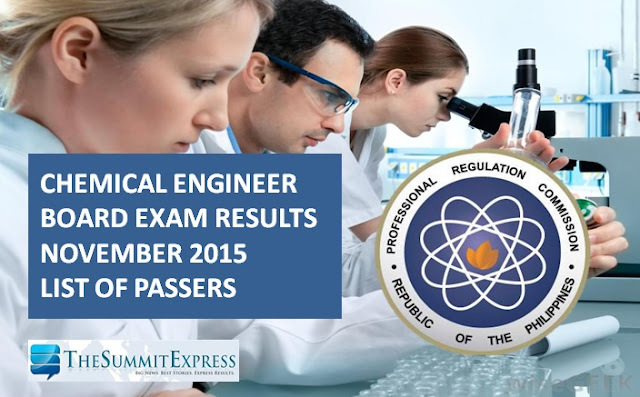 Chemical Engineering board exam was conducted in Manila and Cebu on November 13, 24 and 15, 2015. The three-day exam covered the following subjects: physical and chemical principles (Day 1); chemical engineering principles (Day 2) and general engineering, ethics and contracts (Day 3). In November 2014 exams, PRC announced results in just 1 working day. A total of 596 out of 871 passed the Chemical Engineer Licensure Examination. In May 2015 exams, results were also released in 1 working day. PRC named a total of 239 out of 405 new chemical engineers.